Chrichton's World: Review Curtains (1983): Far too underrated! 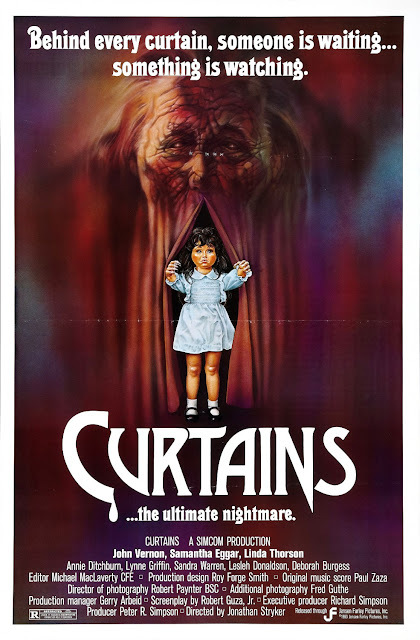 Review Curtains (1983): Far too underrated! This movie might actually surprise you. The acting is quite good and the tone is quite serious. Qua ambiance it is setup like a Giallo and that is always a good thing. Keeping the killer a secret until the end is a good achievement. Although there are some hints that could make you predict who it is. Curtains has some nice killings and for once you really feel for the characters since they aren't as annoying or obnoxious as in most similar movies. The pace however is a bit slow and some scenes are edited in such a way that it adds confusion to the already fairly complicated plot. But in the end it is the reveal that matters which is excellent. In my opinion this movie is far too underrated and much better than any slasher movie produced in the last ten years. It definitely is worth your time.